Settings goals for the new year can feel a little overwhelming. It can be hard to know where to start or what type of goals to set. It can also feel a little forced. The secret is to set goals that actually mean something to you. To get clear on what your true priorities are and create an action plan designed around them. Let's be honest, modern day life is demanding!It's easy to get caught up walking through the motions, living according to what you should do, rather than what you really want to do. And eventually this will only lead to you feeling anxious, restless, unfulfilled, and stuck in your life. .
Here’s the thing, if your goals don’t match up with your true priorities, if you’re living out of integrity with what you really want… your heart and your success will always feel a little empty. So the question to consider is - How do you gain clarity on what you truly want, not what you’ve been conditioned to “think” you want? I have a little activity for you today, something to help you shift your priorities and identify what feeds your soul. Let’s take a closer look at where you spend your time. First, I’ll show you an example of the activity I’m going to have you do, and then, I will walk you through it! 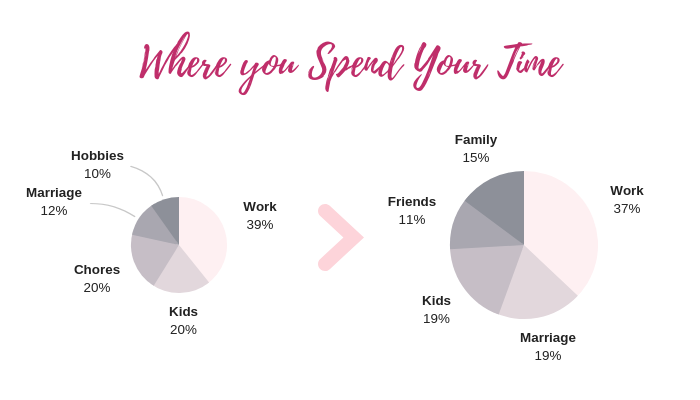 Now that you have a visual representation of how you currently spend your time, let’s create a pie graph of how you want to spend your time in 2019. Think about what is most important to you. The gap between circle one and circle two is where we should create action plans. Visually seeing your priorities can help you clarify how to shift your perspective in time, and help you set the RIGHT goals for 2019 which align with these specified priorities. In January, I am hosting a Purposeful Planning Virtual Retreat where we will take this once step further. A chance for you to get honest with yourself and make sure your life is going in the direction you really want it to go. To gain more clarity around your heart’s true desires so you can set goals that mean something to you and you actually want to stick with. When you do this, that’s when you feel more energized, happy, and fulfilled in your days. That’s when you feel successful in your own eyes. Sounds amazing right? Register at the link below, consider it an early Christmas gift from me to you :) I look forward to seeing you there!